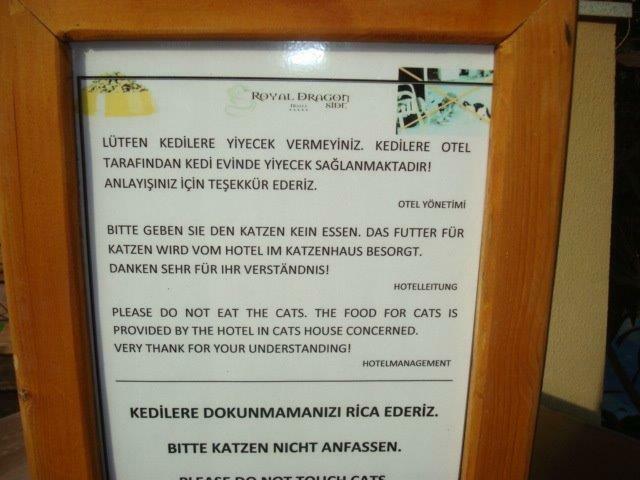 Saw this sign outside a hotel on a recent trip to Turkey. Can you spot the translation error? If you wish to avoid similar results first paws for a few moments before selecting a pedigree supplier. Definitely ask them if they use CAT Tools and also if they will make the deadline by more than a whisker. After that remind them that you don’t have nine lives with your end client only one. When negotiating price don’t listen to any tails about rising costs and so on. Don’t forget to tell them that you have had a catalogue of disasters with other vendors in the past. Hopefully taking these precautions should ensure purrfect results every time.